The glass of Emile Galle is attracting increasing attention among collectors, not only for its inherent beauty and refinement, but also because every piece, so far as we know, has that favourite feature of the collector, a signature. In addition, the style of the period, of which it is so very representative the 1890’s is now recognised as of historic interest, as well as being an example of the taste of our grandfathers. Pictured left: A Gallé Cameo Glass Vase With Shaped Neck Circa 1910 – Overlaid and acid-etched with flowers and leaves, signed in cameo Gallé. Sold for £2,750 at Christies, London, 10 Sep 2013. Image Copyright Christies. During the last decade or so, scholars of many nations have brought the period into historical focus, and we can now see its style as a worthy parallel and successor to those of the past, Gothic and Renaissance, Rococo, Baroque and Regency. Musee des Arts Decoratifs. Paris. Like them, the Art Nouveau (or Jugend as it was called in Germany) has its own distinctive formal characteristics, which again reflect important trends of thought and feeling of the period. Firmly based in the ideas and the art of William Morris and the English Arts and Crafts Movement, it acquired its lyricism and intimacy from Japanese Art, and about 1889-90 it emerged at last in its mature form. Pictured right: A Gallé Cameo Glass Vase Circa 1904-06 – Overlaid and acid etched with geraniums and foliage, signed in cameo Gallé with star preceding. Sold for £4,375 at Christies, London, 10 Sep 2013. Image Copyright Christies. During the next decade or so it became the creative style of artists in many countries on the Continent, but in England it never caught on. Its most important formal characteristics are flowing, swirling lines, asymmetrical compositions, shapes based on natural forms, chiefly plants and trees, and an expressive use of colours. Its prevalent mood is a dreamy lyricism, closely related to the spirit of Symbolist poetry, from which the style has obviously taken important elements. Generally speaking, the Art Nouveau can be described as an assertion of organic life in the face of the increasing industrialisation of European society, and in its time it formed an almost revolutionary contrast to the taste of the preceding age, with its dark colours, heavy, richly-draped forms and solemn imitation of the “great” historical styles. The Art Nouveau occasionally found expression in architecture, but more frequently and perhaps, more convincingly, in furniture, silver, textiles, pottery and glass. The natural fluidity of glass, its willingness to be formed into any desired shape and its capacity for subtle colouring made it a particularly sympathetic material. In the hands of Emile Galle it become formative in the development of the Art Nouveau. Galle was born in 1864 in Nancy, the old capital of Lorraine on the Franco-German border, and here he lived and worked all his life. His father had a factory for decorative faience. In accordance with the taste of his own time, he imitated the styles of the past in his decorative work. Galle pere gained a reputation as a designer of taste and was patronised from high quarters. 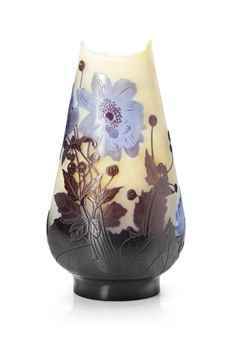 Pictured left: A Gallé Double Overlay Cameo Glass Vase Circa 1910 – With everted neck, overlaid and acid-etched with flowers and leaves, signed in cameo Gallé. Sold for £938 at Christies, London, 10 Sep 2013. Image Copyright Christies. In due course Emile took over his father’s faience factory as well as his workshop for luxury furni-ture, but it was in the family glassworks that he made his most important and original contribution. During his time of apprenticeship in the glass factory of Meisenthal, he had been trained to understand and master every conceivable branch of technique in decorative glassmaking: colour chemistry, blowing and moulding, cutting, engraving and enamelling. After completing his training with studies in the great museums —among them those of South Kensington, he returned to Nancy and began experimenting in the workshop set up for him there. He soon went far beyond what he had learnt and transformed his knowledge into a flexible instrument for genuine artistic expression. Galle was full of ideas and theories about art and its relationship to society, nature and humanity; he threw himself with enthusiasm into the current discussions among artists and critics in Paris. His ideas can be followed in a long series of articles in contemporary periodicals; the most important having been reprinted in a small book which was published posthumously in Paris under the title of Ecrit pour Part” (1908). The basis for his thoughts on art was an idealistic belief in the absolute beauty and truth of Nature and this, in its turn, was founded on his own deeply personal knowledge and love of flowers and trees. A practising gardener and learned horticulturalist, among his ” Ecrits ” one finds several scholarly articles on botanical subjects. The goodness of nature should then be brought to humanity through the interpretation of the artist and man thereby be improved. Galle’s writings do not particularly impress by their logic, but on reading them one cannot help being fired by his passion and enthusiasm, his faith and optimism. In accordance with his ideas, Galle did not consider himself as a mere craftsman, but a serious artist and a messenger of moral and aesthetic ideas. He used natural motifs, pictures of flowers and leaves, insects, shells and fish, almost exclusively as decoration on his glass. Pictured right: ‘Pommes De Pin’, A Gallé Cameo Glass Vase Circa 1900 – Overlaid and acid-etched with pine cones and needles, signed in cameo Gallé. Sold for £6,250 at Christies, London, 23 March 2013. Image Copyright Christies. They are all drawn directly from nature, they have been poetically described and gently organised into flowing, clinging patterns with the distinctive stress on linear rhythms which fashion dictated. Influenced from the current Japanese craze and supported by his own enthusiastic heart, he gave to the whole a touch of poetic lyricism, that is the true hall-mark of genuine Galle pieces, and which his many imitators rarely managed to capture. 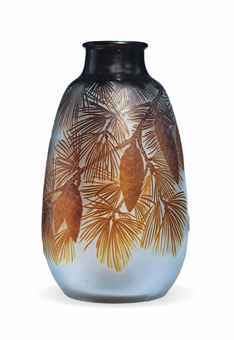 Galle’s nature-style in glass seems to have been developed to maturity about 1890. On a great number of Galles glass (and on his pottery and furniture as well) one finds poetical quotations written in ornamental lettering on the side of the vase; the decoration is then suggestive of the poetic lines (though it is sometimes difficult for us today to grasp the full implications). To Galle, as to so many of his contemporaries, the unity of the arts was an ideal to strive for, and in his verreries parlantes he tried to combine poetry and glass to make his glass poetic, and at the same time to elucidate and interpret the quotation by illustration. The writers he admired most were the great French national poets, especially Victor Hugo, and on the other hand the Symbolists, Baudelai re, Verlaine, Maeterlinck; he also borrowed freely from the poets of his native Lorraine. The Franco-German war, which took place while Galle was at his most impressionable age, added undoubtedly to his passionate feelings for his native region, and his patriotism towards Lorraine and towards France herself —remained an important element in his emotional set-up all his life. The Lorraine cross, with its two horizontal bars, is often integrated into his signatures. As far as we know, all Galles glass is signed. Sometimes a m n ute Emile Galle Nancy is engraved discreetly underneath. the vessel and this may be his personal signature for pieces made by his own hand. At other times his name or his initials have been written vertically in the Japanese fashion. But most frequently his name is found in relief as part of the ” natural ” decoration, in letters formed as of bark or twig, etched out of the surface of the glass in elaborate design. Some vases of cheap green glass with very simple enamel painting is signed underneath with an etched figure of a tree with Galle fitted into the design, and this may be an allusion to the material, which resembles primitive German ” Waldglas ” or forest-glass. The consistent signing of his glass reflects, of course Galle’s exalted ideas of the glassmaker as an artist, on a par with the painter and the sculptor. Once having started signing his glass, he must soon have realised that it was also most conducive to publicity, it undoubtedly added enormously to the popularity of his glass. Today, it has made Galles glass more sought after by collectors than equally good pieces from the same period, which are unsigned. The fashion of signing was, however, soon taken up by many other glassmakers, whose works then immediately entered the category of ” art glass.” Today most art glass and also much tableglass carries the name of its designer or factory or both. As for the glasses themselves, Galles early pieces are often made of transparent glass and decorated with engraving, cutting, enamelling or all three techniques on the same piece. Like most artists of the time we are still in the 1870’s and early 1880’s he borrowed both the shapes and ornaments of his glass from the historical styles of the past. During his museum studies he had become acquainted with the ‘history of art in the widest sense and the elements of his early glass are chosen from an amazingly wide field, from Oriental and Islamic glass and from European art from medieval times until the Rococo. The separate stylistic elements are combined with the greatest freedom and elegance, and the craftsmanship is highly refined. If the early Galle glasses should be criticised it would have to be on the score of flamboyance and exuberance. Galle went on using enamelling on his glass all his life, but as time went on, he became more and more absorbed in pure furnacework and the majority of his later pieces are executed a chaud with glass of many different colours. Most of them are made in the A fine and characteristic vase from Emile Galle’s own hand dating from about 1895. Illustration by kind permission of the Victoria & Albert Museum, in which the vase is housed. cased-glass technique and sometimes as many as five layers of different coloured glass have been put on top of each other and cut away into patterns. Galle aimed at no effect as simple and cameo-like as the decoration on the Portland Vase in the British Museum (the most famous historical piece in his favourite technique.) His models were rather some elegant eighteenth century Chinese glass vases, with clinging flower-patterns in colours on a milk-white basis, and this genre he changed and developed to great complexity. The white background is usually matted and reminiscent in texture of biscuit porcelain, while the coloured patterns have been cut out (sometimes with the help of acid-treatment) with the most subtle feeling for the transparency and thickness of the glass. At the great Exhibitions in Paris in 1878, 1889 and 1900, Galles work was among the sensations and his glass soon became famous far beyond the borders of France itself. At the Exhibition in 1900 every collector or museum with respect for itself acquired a piece or two. As the demand for his poetic and individual works of art in glass increased, he became less and less able to give that close personal attention to each piece, which he had done at the beginning of his career and which indeed this very choice type of glass demanded. He came to reply more and more on the assistance of craftsmen and designers who worked in the style he had created. A few identical pieces have been found with his signature and the variations within a routined style became less and less significant. 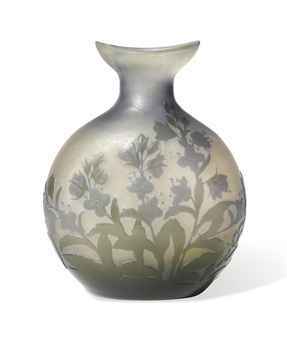 The majority of Galle’s late works consist of cased glass vases in a few simple shapes with clinging flowers in mauve on a matted white background abound. Beside these highly standardised works he made a number of pieces of an almost forced originality and invention, real tours de force of the glassmaker’s art, and sometimes with a real passionate feeling about them; these are probably personal pieces. When Galle died in 1904, at the age of 50, his factory in Nancy carried on under the leadership of his lifelong friend and assistant, the painter Victor Prouve. The activities continued certainly until the first World War. Galle’s pretty, flowery version of the Art Nouveau was a truly original contribution to the formation of the style and it must doubtlessly have been conceived in glass. Later on Galle did, however, apply his “natural” shapes and elegant flower pictures to decorate not only his glass, but also the pottery and the luxury furniture produced in his factories.